H. Rick Bamman - hbamman@shawmedia.com Crystal Lake junior track stand out Cailey Ciezadlo (right) and her "buddy" Kristen Prazdra, a student in the Functioning Living Skills program work together in gym class on Tuesday, May 3, 2016. Ciezadlo wants to major in special education in college. 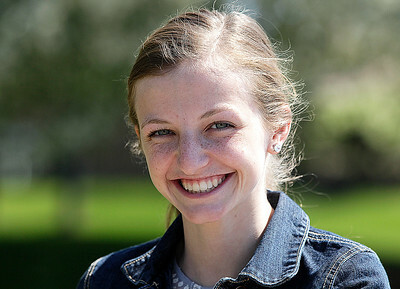 H. Rick Bamman - hbamman@shawmedia.com Crystal Lake South's Cailey Ciezadlo is a junior on the track team who won two county titles. Ciezadlo wants to major in special education in college. H. Rick Bamman - hbamman@shawmedia.com Crystal Lake South junior Cailey Ciezadlo straps "buddy" Kristen Prazdra's feet on to the peddles of a bike during gym class on Tuesday, May 3, 2016. Ciezadlo wants to major in special education in college. 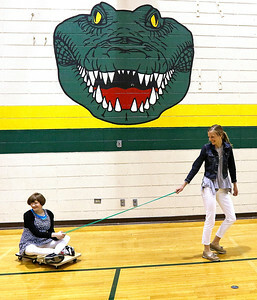 H. Rick Bamman - hbamman@shawmedia.com Crystal Lake South High School junior Cailey Ciezadlo (left), assists her "buddy" Kristen Prazdra, also a junior, in the functioning living skills program as they enjoy the day during gym class on Tuesday, May 3, 2016. Track stand out Ciezadlo who has won two county titles and wants to major in special education in college. Crystal Lake South High School junior Cailey Ciezadlo (left), assists her "buddy" Kristen Prazdra, also a junior, in the functioning living skills program as they enjoy the day during gym class on Tuesday, May 3, 2016. Track stand out Ciezadlo who has won two county titles and wants to major in special education in college.